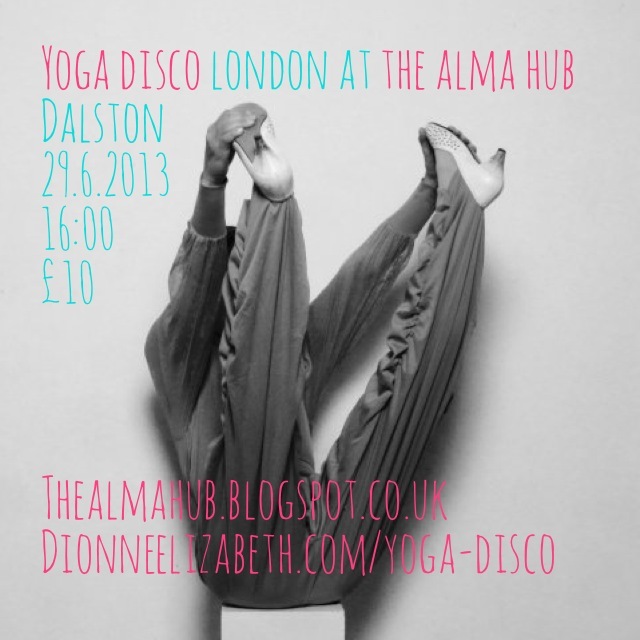 In honour of our mid summer celebration we´re very happy to announce we´ll be having a Yoga Disco at The Alma Hub in Dalston on Saturday 29 June – our first in London! The Yoga Disco comes to The Alma Hub in Dalston – a special curated event courtesy of Brød & Smør DJs. Take part in a stimulating, creative, fun and personal yoga class with an exciting twist. Yoga sequence and soundtrack are crafted to intertwine postures, rhythm and melody, with room to explore your relationship to fluidity, expression and essentially, YOUR yoga. Experience something new with a good time gang and receive bonus nice feelings. Gold lamé optional. Disco kicks off at 16:00 sharp and a limited number of mats are available to borrow should you need. Admission: Ten English Pounds. Includes yoga disco, fun times, dance off and mocktails. Spaces are super limited – only 10 available! This entry was posted in schedule, workshops & events, Yoga Disco and tagged Dalston, London, The Alma Hub, Yoga Disco, yoga events uk, yoga London. Bookmark the permalink. ← Raw vegan energy ball recipe!